The most consonant harmonies in the Bohlen Pierce scale (to my ear) are those that fall within the gamut of Harry Partch’s 7-limit just intonation system. The BP intervals 9/7 and 7/5 (steps 3 and 4) seem to be the most pleasing, and their equal temperament counterparts are less than 4 cents from just. The step 2 interval 25/21 is 302 cents, an acceptable minor third to western ears, but equal temperament changes it to a flat-sounding 292 cents. The step 12 interval 25/9 (B note) is totally outside of the western 12-tone system. 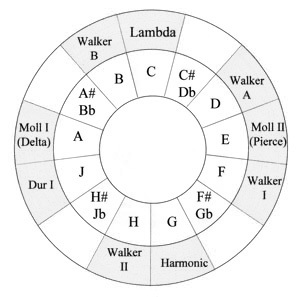 This chart shows the intersection between the Bohlen Pierce scale and the 7-limit just intonation system. The D and B notes suffer the problems mentioned above. The difference between cents and round hundreds is a rough indicator of how alien the interval will sound compared to traditional western harmony.